Earnings have turned out to be a snoozer rather than the recession step down some gloomy souls predicted. Even if the economy is slowing, does it matter for earnings, which keep rising ever higher as net revenues stagnate? Our big takeaway from last week was the remarkable consistency in the big banks missing estimates for trading revenue, even as the Street saw higher volumes across many desks. And no surprise that securities underwriting revenue evaporated with the closure of the high-yield market in Q4 and a tedious equity pipeline. Markets seem to be moving sideways, albeit with lots of hyperventilation from the analyst community. But that does not mean there is no news. First, kudos to George Gleason at Bank OZK for turning in strong Q4 numbers. OZK remains under suspicion, though, due to its role as a benchmark for commercial real estate lending. Likewise regards to the bankers at Goldman Sachs (GS), who supplanted the traders for the first time in a decade in the only measure that matters, namely gross revenue. Of note, OZK outperformed GS last week, with the common of these two very different banks up 21% and 14% respectively -- this after OZK spiked 12% in a matter of hours after earnings were released. And, Lord be praised, both names are now trading just above book value. A year ago, OZK traded at 1.8x book value. Them were the days. Meanwhile in the automotive sector, Elon Musk and his Tesla Motors (TSLA) science project are grappling with the reality of being the most flashy, high cost member of a commodity industry. The latest TSLA announcement of layoffs took the stock down a notch and suggests evidence of liquidity stress to us, but the forgiving narrative in the financial media is that the heroic Musk wants to make money selling his mid-side Tesla 3 sedan. Never mind that consumers don’t want sedans or that the midsize slot in the global auto industry is basically a break-even proposition. Of note, TSLA is trying to squeeze every last penny out of the proverbial lithium nugget by raising the cost of ownership for Model 3 in ways beside an increase in the sticker price. For example, Tesla is officially ending any type of free Supercharging program, a surprise increase in the cost of the affordable Tesla 3. The drastic increase of Supercharging prices around the world is the latest shock for loyal TSLA owners and prospects, but also reveals the financial stress operating inside this still tiny manufacturer of electric cars. As we note in “Ford Men: From Inspiration to Enterprise” the global auto industry is a break even prospect nominally and consumes capital in terms of risk adjusted results. The advertised $35k price tag for a Model 3 is too low to be profitable in the current market. Compare the Tesla 3 with an Audi A-4 starting around $37k or an S-4 starting at $50k. Frankly the highly differentiated Tesla brand ought to be focused on a hybrid SUV that is higher in price than the premium manufacturers. Yet Musk has decided to follow the example of Henry Ford and compete on a lower price in a market that is largely consolidated and financially integrated. Good news for TSLA shareholders, of course, is that the stock is basically unchanged over the past year at about 3x sales, but what a wild ride it has been. To our astonishment, TSLA has a beta of 0.6, meaning far less volatile than the broad markets. But the credit spreads tell the tale. The TSLA 5.3s of 08/25 closed Friday at $87.75 at a weak “B” credit spread with a yield to worst of 7.71% (+500bp over 5 year Treasury debt). Compare to General Motors (GM) 5.1s of 5/25 at +260bp to the Treasury curve and Ford Motor Credit (F) 5.96s of 01/22 at +282bp to the curve. Meanwhile in mortgage land, the misery continues. Even though the spread between the benchmark 10-year Treasury note and the 30-year fixed rate mortgage has widened considerably and, indeed, is near the 2016 wide of 209 bp, profits remain elusive. We note, for example, that Ditech Holding Corporation (DHCP), which emerged from bankruptcy less than a year ago, just missed a debt payment and saw its COO depart. Read the latest DHCP 10-Q for a fascinating discussion of ties to other mortgage firms. Despite a lending profit uptick in Q2 as reported by our friends at the Mortgage Bankers Association, both bank and non-bank loan originators are still losing money on a large portion of their new residential mortgage production. The wise in the industry warn that this earnings winter could last for several more years. 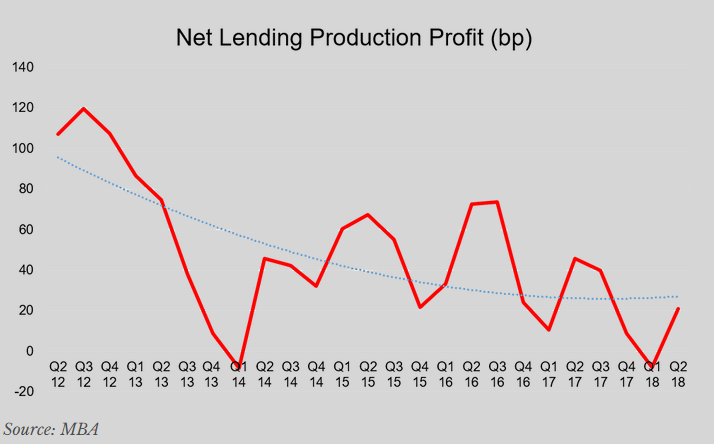 This raises very specific questions of survival for some industry players if the anticipated arrival of the Army of the Dead (aka rising loan defaults) occurs before lending profits recover. But the Creator does have a sense of humor. In December the Federal Housing Finance Agency, which regulates the three GSEs (Fannie, Freddie and the FHLBs), issued new rules for lenders regarding the use of credit scores in loan underwriting. “Chief among those rules is a provision that would prohibit the government-sponsored enterprises from using the VantageScore credit scoring model because of conflicts of interest with the company’s backers,” reports Housing Wire. 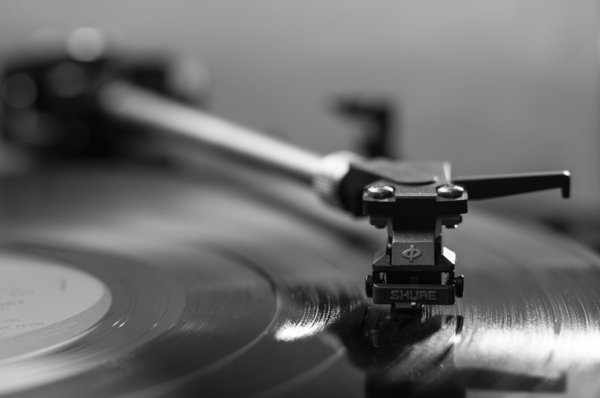 Suffice to say that former agency head Mel Watt had his revenge upon the three credit repositories – Experian, TransUnion (TRU) and Equifax (EFX). See our 2017 comment, "Experian, Equifax & TransUnion want to sell you new mortgage credit scores." This odious triopoly has poured hundreds of millions of dollars into pushing their own consumer credit measure -- Vantage Score -- in Washington. Now that FHFA has spoken, will the big three in the consumer data triopoly be forced to quietly euthanize Vantage Score? More, will the big three be forced to take a write-down of their investment in Vantage Score? Sure looks like a goose egg to us. To add insult to injury, the big three consumer data repositories must now contend with a revivified FICO, which finally realized that incorporating the non-mortgage data components pushed by the Housing Affordability mafia in Washington into the existing FICO benchmark solves the proverbial problem. Viola! Truth to tell, the key constituency in this discussion, namely global bond investors and the credit rating agencies, were never asked and did not care at all about replacing the familiar FICO credit scores. Another recent victim amidst the sideways shuttling financial market is the notion of green investing in big power. The bankruptcy of electric utility PG&E in the aftermath of the California wildfires basically suggests that providing electricity in CA may be an entirely uneconomic proposition, begging the question as to policy driven green investments. So even though global equity markets are essentially moving sideways, don’t think there aren’t lots of important and even amusing things going on away from the TV cameras in the world of credit and risk. With the S&P 500 still down single digits vs a year ago, and financial bellwethers like JPMorganChase (JPM) lingering in the red by a like margin vs the exuberant valuations of last January, the global equity markets still have a long way to go before reaching solid ground. Adjusting to a world with no Fed bond market intervention and a very ambitious forward Treasury borrowing calendar will take a great deal of time. We suspect that the real test of the present market stability will come when China starts to aggressively sell dollars to prop up its sagging currency. Notice in the Treasury yield curve chart above that short-term T-bills out to 6 months are still rallying, but the rest of the complex is moving higher in yield/lower in price. Remembering that former Fed Chairs Bernanke/Yellen et al dispensed with the inverse relationship between stocks and bonds as a result of QE, the next surge for the exit may look different from December. 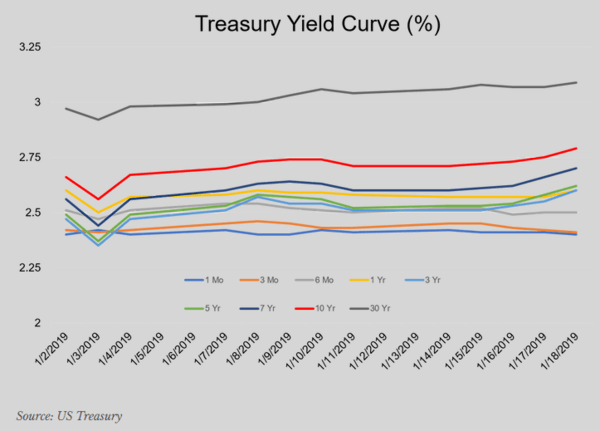 When we see all of the yields on the Treasury curve heading higher, this under the dead weight of new issuance, then the great unwind in equities may also accelerate.